Made from authentic subway tokens, these accessories provide you with a link to the past. Who would have thought that mass transit would play a part in individual style? 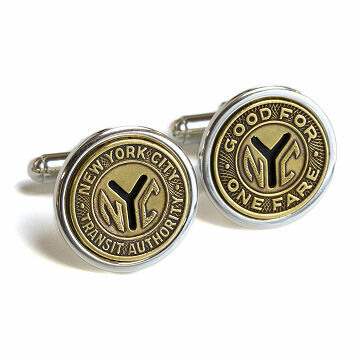 These authentic, old fashioned subway tokens have been turned into cufflinks, providing you with a link to the past and a inventive way to keep your shirt buttoned. Handsome and classic with an urban twist, these subway token cufflinks are as original and memorable as the cities they hail from. Sterling silver backing. Available in New York, Los Angeles, San Francisco, Boston and Chicago. Made in the USA. My husband loved these cufflinks. However, after normal use the token fell off the cuff link. This is very disappointing because it was a gift and expensive. Now it's useless. LOVE this unique gift! theyre awesome! Purchased for my son for Christmas as a momento of a recent NYC trip and college visit to Columbia. He loved them! I've purchased these before and they are great for the hard to please/hard to surprise collector. They are authentic and well made! Gave these to my husband. The tokens are mounted in sterling silver. He was suprised to see authentic tokens on a cufflink. He owns many sets of cufflinks this is his favorite! Purchased as a gift for my husband's father. When on a trip together he kept singing the song "the Man Who Never Returned." The song is about a man who took the subway in Boston and didn't have fare to get out of the subway. Seeing these made me think of that trip. He is a business man and frequently wears cufflinks so I knew it would be a perfect gift. The cufflinks came in a beautiful box with authentic (at least looking) subway map, etc (as described) that added nice touches to the gift. They are unique and stylish! He loved the cufflinks and the packaging was also really impressive. I had very positive feedback from the person to whom I gave the gift. He loves NYC, but is currently living in Texas for work and appreciated the small reminder. He does not like very obvious designs and enjoys things with a bit of a story behind it and said the cufflinks were a perfect fit for him. Wow. . .what an unique gift. This is the perfect gift for someone who has everything. The cuff links are beautiful but they arrived in a plain white box and not in the map decorated box that is shown, and described by others. Since they were a gift I was disappointed by the presentation. My husband LOVED the cufflinks!! The Boston Subway tokens cufflinks are very cool. A unique gift that was well made and quirky. so glad that I found uncommongoods. The presentation of these little cufflinks was unbeatable. They come in in a heavy white box inside UG's recycled t-shirt gift bag. Inside the box, wrapped in tissue, is a jeweler's box with New York transit map on the lid, and a card from the Transit Museum. The cufflinks themselves are sturdy, heavy, nicely detailed and beautiful. These were a wonderful gift, and my boyfriend was thrilled. They're classy enough for any occasion, and the retro style is very appealing.